Good morning, Friends! I am so excited! I was asked to be a part of a wonderful group of stampers that do a blog hop twice a month! We call ourselves the The Stamp Review Crew. Each hop will showcase many wonderful ideas of how to use just one stamp set! Isn't that awesome?!! I love that idea! And there are really SO many wonderful ideas because of all the very talented people in this group! This month The Stamp Review Crew is featuring the stamp set Hearts a Flutter. I really love this set and matching framelits! Really makes for easy card making! I am showing a card that I did with my stamp club last month. Super simple! I hope you enjoyed my card! Thanks so much for stopping by! Click the link below to visit the next stop on the hop. If you get lost you can go to the main blog here to get a list of the designers participating in today's hop. Have a super day! I too love Crumb Cake and Real Red together! Clean & simple with a little pop of bling...love it! Red and Crumb Cake's biggest fan....that's me! lol I love your simple but oh so lovely card. You do this style so well! Great color combo! I really like the Crumb Cake card base The glimmer is a great extra touch too! Sweet and simple, I love it! Crumb Cake and almost anything make me happy :) Thank you so much for joining the crew! Cute!! I love the Glimmer Red heart on it and how you used the embossing folder!! 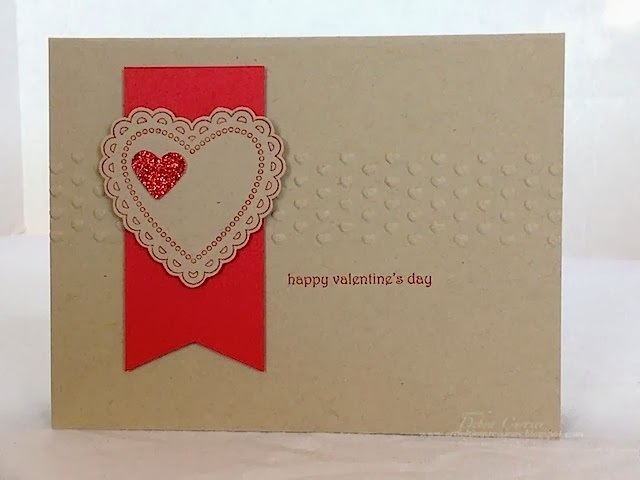 What a sweet card Love the color combo and the row of embossed hearts. This is a great card. You could send this to adult or child. Simple but it really stands out with that sparkly red heart! I always love ideas for simply beautiful cards. Yours is perfect! Love the color combination and bit of bling. Love the simplicity of your card. Perfectly balanced in color and layout. Pretty! Clean and simple perfection, Deb! The glimmer heart adds the perfect bling! Great card! I love the subtle embossing and the wow of the glimmer heart! Love this card and what doesn't look good with Crumb Cake?! The embossing really sets off your heart banner, just lovely. Great card with this set. Love the subtlety of the details on it. Deb, this card is darling! I love this color combination - always have. And your clean and simple style is something I always enjoy and envy :) So glad you are a part of the Stamp Review Crew Hop! I am in love with your color choices and the design...I totally forget how beautiful these colors are together and love plain and simply style cards...TFS! Great clean and simple card! Love the little addition of the glimmer heart.